George Denis Patrick Carlin (May 12, 1937 – June 22, 2008) je ara Amerika alawada ori itage, ayewo awujo, osere ati olukowe, to gba Ebun grammy marun fun awon awo awada re. ↑ Murray, Noel (November 2, 2005). "Interviews: George Carlin". The A.V. Club (The Onion). http://www.avclub.com/content/node/42195. Retrieved 2008-06-23. 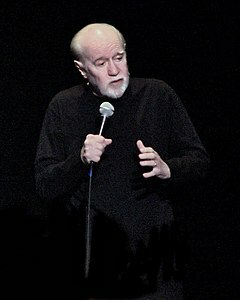 ↑ Carlin, George (November 1, 2004). "Comedian and Actor George Carlin". National Public Radio. http://www.npr.org/templates/story/story.php?storyId=4136881. Retrieved 2008-06-23. ↑ Alan Cho, Gauntlet Entertainment (2005-11-24). "Gauntlet Entertainment — Comedy Preview: Russell Peters won't a hurt you real bad - 2005-11-24". Gauntlet.ucalgary.ca. Retrieved 2009-07-30. ↑ Smith, Kevin (2008-06-23). "‘A God Who Cussed’". Newsweek. Retrieved 2008-07-27. Àtunṣe ojúewé yi gbẹ̀yìn wáyé ni ọjọ́ 30 Oṣù Kẹ̀wá 2013, ni ago 02:09.